The SI-111, manufactured by Apogee, is a precision infrared radiometer that determines the surface temperature of an object without physical contact. It measures both the subject's surface temperature and the sensor-body temperature. A Campbell Scientific datalogger uses these measurements to calculate the correct temperature of the subject. The SI-111 consists of a thermopile, which measures surface temperature, and a thermistor, which measures sensor body temperature. 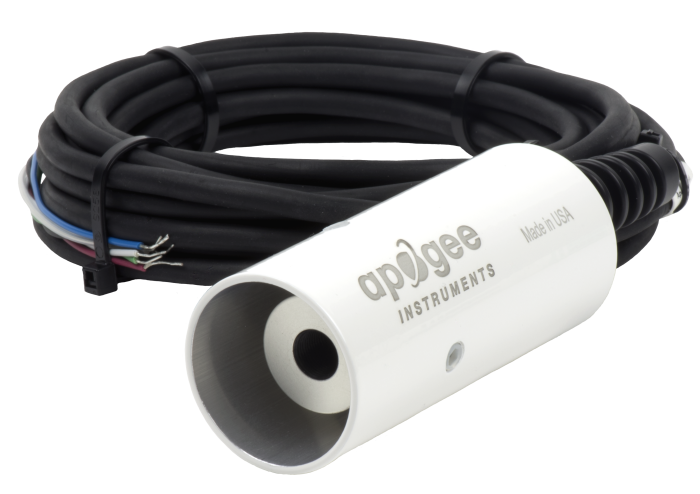 The two temperature sensors are housed in a rugged aluminum body that contains a germanium window. Both the thermopile and the thermistor output a millivolt signal that most of our data loggers can measure. The data logger uses the Stefan-Boltzman equation to correct for the effect of sensor body temperature on the target temperature. The corrected readings yield an absolute accuracy of ±0.2°C from -10° to +65°C. The SI-111 has a 22-degree half-angle field-of-view (FOV). The FOV is reported as the half-angle of the apex of the cone formed by the target (cone base) and the detector (cone apex). The target is a circle from which 98% of the radiation viewed by the detector is being emitted. Note: Prior to November 2008, the SI-111 was named the IRR-P. The SI-111 is often fastened to a CM200-series crossarm, a tripod or tower mast, or a user-supplied pole using a CM230, CM230XL, or CM220 mount. The CM230 and CM230XL are adjustable inclination mounts that allow the SI-111 to be mounted perpendicular to the target surface when the target surface is on an incline. The CM230XL is similar to the CM230, but the CM230XL places the SI-111 further from the pole or crossarm. The SI-111 may also be attached directly to a user-supplied camera tripod. How often should the SI-111 be calibrated? As a general recommendation, recalibration should be done every two years. Does the SI-111 need to be protected from short-wave radiation? Using a radiation shield with the sensor helps keep the sensor body temperature in close approximation to the ambient air temperature. Ultimately, the need to protect the sensor from short-wave radiation is dependent on what is being measured and under what conditions. For example, Campbell Scientific recommends using a radiation shield for canopy measurements. The information included on a calibration sheet differs with each sensor. For some sensors, the sheet contains coefficients necessary to program a datalogger. For other sensors, the calibration sheet is a pass/fail report.